I see patients who bruise their nails in many different ways — they’ve shut fingers in doors, hit them with hammers, and even crushed them under free weights while working out at the gym. When a nail is injured, it can assume a number of different appearances. The most common, of course, would be a discoloration of the nail plate due to bleeding under or around the nail. This condition is referred to as a subungual hematoma, or hemorrhage in the nail plate (similar to a bruise on the skin). When this occurs, the blood accumulates under the nail and it usually causes the nail plate to separate from the nail bed. In addition, the accumulation of blood underneath the nail plate can create pressure and pain. To relieve the pressure, a doctor will cut back the nail plate with a nail nipper to release the accumulated blood. This now leaves the nail bed exposed, and the client will have to wear a bandage for a few days. The new nail will grow in more rapidly when the separated nail plate is cut away. Likewise, if the nail plate is separated from the nail bed or there is significant pain associated with the discoloration, again it is advisable for the client to be evaluated by a dermatologist before the nail technician continues with any manicuring or cosmetic applications. Once the discolored, bruised, or infected nail has been properly diagnosed by a doctor and treated, it is then safe for the nail technician to work on that client, provided there is no sign of infection, bleeding, pain, or an allergy to acrylic. A tip may be applied to the remaining nail plate if the client has no sensitivities to the products (not recommended for clients with chronic lifting). There is no harm in applying nail polish (clients may actually appreciate the camouflage). To be on the safe side, you can ask for written permission from the patient’s physician before you work on her nails. Work very gently around the cuticle area, particularly if the nail is not completely normal because this might cause an infection and complicate the healing process. If there is a change in the nail’s appearance or symptoms such as bleeding, the nail technician should recommend a re-evaluation by the client’s physician. It is particularly important when working on a client with an injured nail to use disinfected instruments and keep the work area scrupulously clean. I suggest nail technicians use gloves to protect herself and her client. There is a problem that arises, however, if the history of injury to the nail is uncertain. In such cases, if there is a brown or black discoloration, then it is essential to determine whether the discoloration could be due to a so-called melanocytic lesion, which is like having a mole or colored birthmark under the nail. 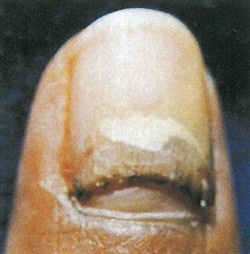 The reason that this is so critical is because on rare occasion it can be an early sign of melanoma of the nail. Therefore, if a nail technician sees such a condition, she should strongly urge her client to seek advice from a dermatologist. The dermatologist may need to perform a biopsy at that time in order to determine the nature of the discoloration. Since it takes approximately six months for a fingernail to grow from the cuticle to the far end, and 12-18 months for a toenail, the client can be followed carefully on a biweekly basis until the nail grows out and is normal. The nail technician can continue to work on the client’s nail during this period of growth, which may vary considerably. In fact, it may be very helpful for the client to be under the care of a nail technician during the healing phase because the nail technician’s applications not only will provide the client with good cosmetic camouflage, but could aid the healing process as well. Therefore, this is a good approach to the client with a bruised nail and an opportunity for the nail technician to provide a valuable service. Keep in mind again that any unusual change in the client’s nail appearance or associated symptoms should alert the nail technician to recommend a reevaluation by a physician.